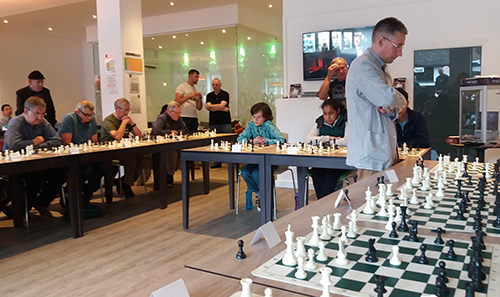 Saturday 17th, 25 chess enthusiasts had the pleasure of playing GM Mickey Adams in a simultaneous exhibition held at the perfect venue of Ludorati Game Cafe in Nottingham. The five times and reigning British Champion has, during his paying career, beaten the likes of Anatoly Karpov, Vishy Anand, Vladimir Kramnik and Magnus Carlsen and has been ranked as high as World #4. Despite a strong field, Mickey won 22, drew 2 and lost only 1 game to David Levens. I'm a great fan of Michael Adams, so it was pretty special to play against him, and also to chat to him before the event began. I couldn't resist asking him about his game with Boris Gelfland in the London Classic in 2013 when Boris turned the tables on him by Queen-side castling deep in the game. Michael admitted this move was totally unexpected by him at the time.I thanked him for a game he played in the British Championship at Canterbury, the opening system of which I've copied with some success. He spoke about the last round of the recent Baku Olympiad. He'd returned from Baku during the week, used to live in London, but his base now is Taunton. The downside of this is the extra travel to events. I asked him if he wrote or planned to write any books. Although he writes a regular newspaper column, he prefers to concentrate on playing rather than writing a book. Michael was at the event early. He was approachable and courteous, and responded to the requests of press, organisers, players and supporters at the event on the day. We're very lucky to have him at the top in British chess. Long may he continue. Our Game. I think I survived the opening intact. He appeared to play quietly in a closed Sicilian with g3, Bg2 and h3. But aleady after White's 13th move, I was down to a 1 Good Move response. One Slip I didn't find the Good Move. I played a dodgy one, which he jumped on. After that the execution was swift in line with that of most of the players around me. The event finished earlier than anticipated. The necessary move in the position was 13 Be5! to give my Knight on the rim a retreat square. Congratulations to David Levens on beating Mickey, and to Ray Evans and Chris Budd on their draws.